FORT WORTH, Texas – James Buescher will make his belated 2013 NASCAR Nationwide Series debut this weekend with a clear conscience, and carrying a Texas-sized I-O-Y’all from his father-in-law. The reigning NASCAR Camping World Truck Series champion and a past NNS winner, Buescher will wheel the No. 34 Wolfpack Energy Services Chevrolet Camaro fielded by Turner Scott Motorsports during Saturday’s Johnsonville Sausage 200 on the 4.048-mile, 14-turn Road America layout in Elkhart Lake, Wis.
Buescher’s experience on road-courses has been limited to a single series start at Watkins Glen (N.Y.) International in 2011. But Buescher did take part in an open test session at Virginia International Raceway last month, aiming to gain road-course experience for the NCWTS race at Canadian Tire Motorsports Park on Sept. 1. Crew chief Michael Shelton and Buescher’s Truck Series regulars will be in the pits at Road America, Race No. 14 on a schedule James originally thought he would be pursuing fulltime this season. Buescher claimed the Truck Series title with a 13th-place finish in the 2012 season-ender on Nov. 16 at Homestead-Miami Speedway, where team-owner/father-in-law Steve Turner celebrated the first NASCAR championship for the organization then known as Turner Motorsports. Buescher, competing in his fourth full NCWTS season and second for fellow-Texan Turner, finished six points ahead of Timothy Peters of Red Horse Racing. Trophy in-hand, Buescher had delivered on an ultimatum issued by Turner at the beginning of the season – win the Truck Series title if you want to move into a fulltime Nationwide Series ride in 2013. But Buescher’s pragmatism and the behind-the-scenes intervention of a major sponsor prompted driver and dad-in-law to reconsider and ultimately postpone James’ inevitable move up the NASCAR ladder. Buescher’s title defense admittedly has gotten off to a sluggish start. Despite qualifying on-pole for the SFP 250 at Kansas Speedway in April, he is winless through the season’s first seven races and hasn’t led a lap since pacing a season-high 55 in Race No. 4 at Kansas City. Buescher sits sixth in the Truck Series standings following his ninth-place finish in the WinStar World Casino 400 night race at Texas Motor Speedway here on June 7. With 235 points, Buescher is 50 markers behind series-leader Matt Crafton of ThorSport Racing but only five behind fourth-place Johnny Sauter, also of ThorSport, heading to Kentucky Speedway for the UNOH 225 on June 27. Buescher, who turned 23 in March, certainly knows his Truck Series history. Led by four-time champion Ron Hornaday Jr., three drivers have won multiple championships in the touring series whose history dates to Mike Skinner’s title in 1995. Hornaday (1996, 1998, 2007, 2009) has been joined by Jack Sprague (1997, 1999, 2001) and Todd Bodine (2006, 2010) as multiple champions. But no NASCAR veteran (Ted Musgrave) or hot-shot phenom (Austin Dillon) has won back-to-back Truck Series titles. 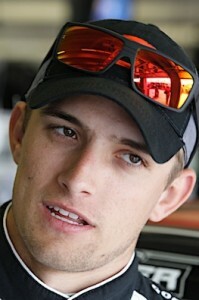 “I need to continue to improve as a driver and think a second championship is doable,” said Buescher, driver of the No. 31 Chevrolet Silverado now sporting Atlanta-based Rheem Manufacturing Company and its heating and cooling products as primary sponsor. “And I wouldn’t say I’m any less motivated. I don’t walk around the garage saying, ‘I’m the champion – you guys have to bow down to me.’ I don’t do any of that. “I showed up at Daytona (for the season-opener in February) and people asked where my championship ring was. My answer was, ‘It’s at home, and that was last year.’ You can’t be any less motivated because you did it last year. Turner, who added Harry Scott Jr. as co-owner of his Mooresville, N.C.-based organization this year, said James’ career dynamics began to change dramatically as he marched toward the 2012 championship. 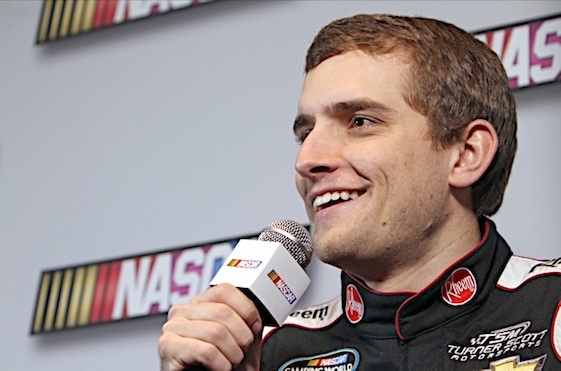 Buescher insisted he will continue to march to his own career timetable. “I don’t put that much pressure on myself,” said Buescher, a resident of Katy, Texas. “I don’t need to be a Cup driver jut to say I’m a Cup driver. I’m comfortable with who I am. I want to enjoy myself and have fun in racing. I’ve been in a Truck and Nationwide program where I wasn’t doing well and to me it was just miserable. 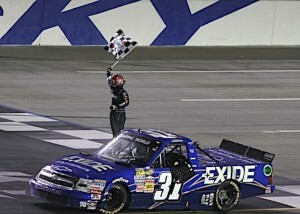 Buescher captured his first NNS win in February 2012 in the season-opener at Daytona International Speedway. Buescher competed in 20 NNS events in 2012, logging two top-five and eight top-10 finishes while compiling average finish of 13.4. Buescher has 54 career NNS starts heading into Saturday’s road-race, which will be televised live on ESPN at 5 p.m. (EDT) and broadcast on SiriusXM Radio, Channel 90 and MRN Radio. Buescher laughed while recalling his initial Truck Series title perk, which arrived in a flat cardboard box during the wee hours of Saturday, Nov. 17, before dawn had broken on his first full day as champion. “I made it back to the hotel at 4 in the morning and ate some pizza,” said Buescher, alluding to what passes for NASCAR’s unofficial breakfast of champions. “It was just a late night after all the obligations we had (at HMS). No crazy parties but I enjoyed the whole weekend. Buescher added there are real advantages to returning to the Truck Series, not the least of which is a less hectic lifestyle for himself and his wife, the former Krishtian Turner. They were married before the start of the 2012 season. Buescher, who won four Truck Series races in 2012, also is eager to contribute to the business side of the family’s organization. This is TSM’s fourth season of fulltime NASCAR competition. “We’re in it together,” said Buescher, referring to Turner. “I’ve done a lot to build this program, this team. I’ve been around Turner Scott Motorsports since Day One. I’ve helped build it to what it is. We came a long way in a fairly short period of time and it’s pretty impressive what we’ve been able to accomplish.